Food and agriculture have major impacts on the environment and health, both as a result of the production methods employed and the quality of the food produced. Research has shown that organic methods can conserve and enhance biodiversity and soils, reduce non-renewable energy and other input use, reduce pollution, protect water resources and mitigate climate change. Restricted pesticide and fertiliser inputs, more diverse crop rotations and the greater number of species grown all contribute. Our research focuses on the wider impacts of organic and other farming systems and the assessment of their sustainability and contribution to delivery of ecosystem services. It also explores concepts of health applicable to individual organisms and ecosystems, reflecting that the interactions of soil, plant, animal, humans and the planet through ‘health’ is a key principle of organic agriculture. Human health is seen to be dependent on a healthy soil, healthy plants and healthy farm animals. This includes the provision of safe, nutritious, high quality food in sufficient quantities. ORC with the Game and Wildlife Conservation Trust was commissioned by Scottish Natural Heritage to produce a detailed report on the Role of Agroecology in Sustainable Intensification to contribute to the debate on how a more productive yet eco-efficient agriculture can be achieved. The study provided a comprehensive overview of how system redesign and individual farm practices can be applied to improve efficiencies in agriculture and the food chain, and how the productivity, financial and environmental performance of different farming systems could be influenced by their adoption. The question of whether farming provides a ‘public good’, beyond the production of food, was also addressed in 2014 through a Defra-funded project testing a modified version of ORC’s Public Goods Tool on conventional farms. We worked with seven advisors from a variety of organisations working in the conventional sector who used the tool on 32 conventional farms. The feedback from the advisers and farmers was generally positive. The majority agreed that the tool gives relevant information and identifies areas of strength and weakness in the farm’s public goods provision and has the potential to increase farmers’ understanding of public goods and the provision of these on their farms. Several were interested in using the tool in future. With funding from the Ekhaga Foundation, we were able to compare a range of sustainability assessment tools against criteria set out in the FAO’s Sustainability Assessment of Food and Agriculture (SAFA) guidelines. In addition to identifying the strengths and weaknesses of existing approaches, this project highlighted the interdependencies and correlations between indicators on the basis of scientific literature, an expert workshop and an online survey. The project found that the inclusion of metrics within the areas of social sustainability and good governance should be encouraged within existing tools. It also identified areas perceived as potential strengths of organic farming (e.g. ecosystem diversity, soil quality and greenhouse gas emissions). ORC work on the Defra-funded Greenhouse Gas Platform project included an analysis and evaluation of the usefulness of existing data sources for the GHG inventory. We also organised an industry focused workshop to present the draft take-home messages for producers. A draft final report on data sources that could be used to monitor industry progress on GHG mitigation measures has been produced. The final reporting of this project will be in 2016. Early results from a staff PhD, supported by the Ratcliff Foundation, exploring the impacts of a widespread conversion to organic management in England and Wales on agricultural greenhouse gas emissions, have illustrated the relative energy efficiency of organic systems and the potential for organic practices to improve nitrogen-use efficiency and reduce N2O emissions. The Ekhaga Foundation has also enabled us to investigate the wider health impacts of organic and agroecological agriculture. In two projects (Health Concepts and Health Networks), we established an international and interdisciplinary network of farmers, advisors and scientists, to jointly develop new and improved approaches to health research in ecological agriculture. This work is based on the IFOAM principle of health, stating that the health of soil, plant, animal and human is one and indivisible; and therefore explores health impacts in all domains as well as ecosystems. The Health Concepts project reviewed and defined concepts of health at the different levels. In the Health Networks project, groups of best practice farmers in the UK, Germany and Austria are now working together to identify which principles, visions or strategies they have adopted that make their farm and its outputs healthy. During a series of national and international meetings, the best practice farmer groups have established their own personal health principles and strategies, with the aim to support other farmers and growers in operating healthy farming systems. We have continued as members of the international Food Quality and Health (FQH) organisation, attending a conference organised by them in Rome on organic and sustainable diets in 2014, which was followed by ORC hosting an FQH international workshop on organic and sustainable diets at ORC in April 2015. Farm system health in practice Ekhaga Foundation, Sweden This project uses participatory approaches to work with the established network of example farms in the UK, Germany and Austria to jointly develop a set of criteria (a) for farm health measurement and (b) for practical knowledge multiplication. Further Development of Methodologies for Sustainability Assessment and Monitoring in Organic/Ecological Agriculture Ekhaga Foundation, Sweden Working with the Swiss Research Institute of Organic Agriculture (FiBL) we are pooling our expertise to further develop methods for sustainability assessment and monitoring for organic farms. PhD programme: An assessment of the environmental and economic impacts of a large-scale conversion to organic farming in the UK The Progressive Farming Trust Ltd The work proposed will be a policy-focussed series of papers exploring the theme of a large-scale conversion to organic agriculture within the UK and the sector’s relative environmental and economic performance to non-organic/conventional farming. Developing best practice networks of health in organic agricultural systems Ekhagastiftelsen Developing an international network of producers, advisors, scientists and other stakeholders, to jointly elaborate new and interdisciplinary approaches to health measurement and health research in ecological agriculture. Reviewing and Developing Health Concepts for Ecological Agriculture Ekhaga Foundation, Sweden The project aims to critically review current health concepts in agriculture, to develop new, comprehensive and consistent health concepts for ecological agriculture. Development of methodology for assessing the environmental, economic and social characteristics of (organic and non-organic) farming systems (FSAM) DEFRA A range of UK farming systems will be described. A methodology will be developed, to describe their economic, environmental and social characteristics, from a life-cycle approach to capture inputs, products, outputs and impacts of the systems. Public Goods Tool (PG tool) DEFRA through Natural England The OCIS public goods project produced a tool which is designed to provide a simple, measurable and accessible way to show the ‘Public Goods’ that accrue through organic farming systems and the addition of an OELS agreement. 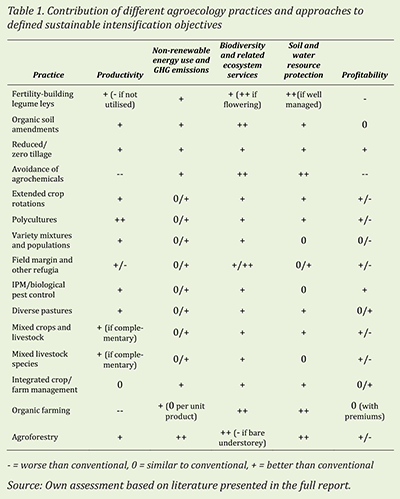 Lampkin, NH, Pearce, BD, Leake, AR, Creissen, H, Gerrard, CL, Girling, R, Lloyd, S, Padel, S, Smith, J, Smith, LG, Vieweger, A, Wolfe, MS (2015) The role of agroecology in sustainable intensification. Report for the Land Use Policy Group. Organic Research Centre, Elm Farm and Game & Wildlife Conservation Trust. Smith, L.G., Little, T. (2013) Environmental Footprinting for Farm Businesses. 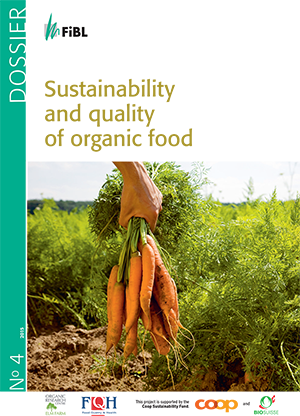 Report for Welsh Government, produced as part of Better Organic Business Links project. Gerrard, Catherine L; Smith, Laurence; Pearce, Bruce; Padel, Susanne; Hitchings, Roger and Measures, Mark (2012) Public goods and farming. In: Farming for food and water security, 10. Sustainable Agriculture Reviews, no. 8380. Springer, Dodrecht Heidelberg New York London, pp. 1-22. Gerrard, CL; Moakes, Simon and Padel, Susanne (2012) The use of Farm Business Survey data to compare the environmental performance of organic and conventional farms. International Journal of Agricultural Management, 2 (1), pp. 5-16. Smith, L. (2009). Anaerobic digestion – it’s a gas. Organic Farming, Spring 2009. Smith, L. (2009). On farm nutrient management. Transition Farming event, 10th June 2009. Royal Agricultural College, Cirencester. Smith, L. (2009). No fertiliser? Where is the Nitrogen going to come from? Transition Farming Event, 10th November, 2010. Royal Agricultural College, Cirencester.